Will transportation be available to/from pilgrimage sites? If this is not possible, we will do our best to accommodate your situation. Please explain your situation in the comments section of the registration form and organizers will contact you. Will I have to carry my luggage the entire time? No. Pilgrims' extra luggage should be brought with them to St. Joseph-Manchester and it will dropped off at St. Joseph in Clayton. Details will be shared with registrants as the date nears as to how that process will work. However, you will have to carry anything you choose to bring with you on the walking portions of the Pilgrimage, such as a water bottle, rosary, or extra snacks. Additional drinks will be available in the support vehicle as we make stops. How long is the pilgrimage? This is a walking pilgrimage of about 24 miles in total, with an optional overnight stay. The entire pilgrimage should last approximately 27 hours from Saturday about 9:30 a.m. through Sunday around 12:30pm. On Saturday, pilgrims should bring their own light snacks if they wish to eat. Dinner will be provided Saturday night and a light breakfast (muffins, bagels, granola bars) on Sunday will be provided as well. Some snacks and water throughout the pilgimage. Participants are encouraged to bring other provisions as desired or as dietary needs require. If you would like to make a contribution towards the cost of these meals (or other costs associated with the pilgrimage), please indicate this when you register. Will I be able to go to confession? Yes, a priest will be available throughout most of the pilgrimage for confession. Confessions will be heard at St. Joseph in Clayton during Adoration or while walking. The priests can drop back from the group to hear confessions as necessary. I want to participate in the entire pilgrimage. Do I have to stay overnight? No, if you want to participate in the Joseph Challenge on both Saturday and Sunday, you do not have to stay overnight at St. Joseph in Clayton, but it is highly encouraged. A major component of the Pilgrimage is the fraternity with the other men and the enduring of this challenging pilgrimage together. If one man went home to sleep in his soft bed while the others remained to sleep on the hard basement floor, some aspect of fraternity would be lost. You would also need to be back at St. Joseph in Clayton in time to depart with the group on Sunday morning, and you would be responsible for arranging your transportation home and back. The route will be through the heart of the St. Louis metro area and will take place almost entirely on concrete or asphalt sidewalks and streets. The route will take pilgrims through some busy areas/neighborhoods, but also through some quiet parks. A significant portion will be in the heavily urban central corridor of the City of St. Louis. Check out this map to see roughly where the route will take us. Is my family invited to attend any part of the pilgrimage? Family and friends are welcome (and encouraged!) to attend the Masses that will be offered - approximately 3:30 p.m. on Saturday at the Carmel of St. Joseph and the closing Mass at 11am on Sunday at the Shrine of St. Joseph. The remainder of the pilgrimage is intended to be an opportunity for the participants to "disconnect" from the world and focus on their relationship with God. In this sense, the Pilgrimage is like a retreat. Of course, any man 18 years old and up is welcome to participate in the pilgrimage including any family members. This would be a great father/son bonding experience, for example. If you want to bring your nephew, God-son, uncle, or any other man in your family over the age of 18, it is highly encouraged! I am 17 now, but I turn 18 before the Pilgrimage. Can I still participate? Yes, any man at least 18 years old can participate in the The Joseph Challenge Pilgrimage. If you are not 18 by the day of the pilgrimage, we ask that you pray for the pilgrims attending this year and join us for next year's pilgrimage. The weather in Missouri in early May can be unpredictable. The Joseph Challenge Pilgrimage will continue as planned through inclimate weather, though considerations will be made if the weather is severe. We will communicate with participants as the date draws near and forecasts are available. In the meantime, pray for good weather! That is up to individual participants. The Joseph Challenge Pilgrimage is intended to be, in a sense, a retreat. But many people use their phones for other things, such as a camera, or as a prayer book. In order to communicate with rides, or in the case of emergencies, it may be a good idea to have your cell phone. Pilgrimage organizers will have their cell phones at all times. Also, remember that we will be walking through a densely populated area. In the case of a drastic emergency, a phone or help will not be far off. 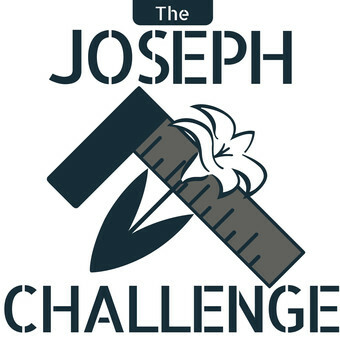 What is the cost to participate in The Joseph Challenge? We are not asking participants to pay a registration fee. Contributions to help defray costs (meals, snacks, priest travel) and to support the Shrine of St. Joseph are appreciated. Please indicate when you register that you are willing to make a contribution and organizers will contact you. No, you do not have to be Catholic to participate in The Joseph Challenge. However, the Sacrament of Reconciliation is only offered to baptized Catholics, and reception of Holy Communion during Mass is reserved for Catholics in the state of grace. Non-Catholics may participate in all other aspects of the Pilgrimage. Will the Mass on Sunday count as my Sunday obligation? Yes. The Mass at the conclusion of the Joseph Challenge Pilgrimage will count as your Sunday obligation. Your family is welcome to attend the Sunday Mass as well as the Mass on Saturday at the Carmelite Monastery. Are showers available when staying overnight at St. Joseph in Clayton? No, showers are not available at St. Joseph in Clayton. This is a pilgrimage after all, which requires some sacrifice. Forgoing a shower for one night might simply mean you need to apply some extra deodorant in the morning. What if in the middle of walking I cannot complete any given phase of the Joseph Challenge due to injury, illness, or some other reason? A ride will be available to come pick up any pilgrim who cannot physically reach the next destination of the Pilgrimage. Who is organizing the Joseph Challenge Pilgrimage? The Joseph Challenge Pilgrimage is being organized by Catholic laymen. It is not affiliated with any particular group or parish in the Archdiocese of St. Louis or the Catholic Church, although we have the cooperation and support of the locations involved. We have support from organizations such as Those Catholic Men, and local Knights of Columbus councils, but this is not an official event of any organization. I'm not physically able to participate, but I still want to be involved. What can I do? If you like the idea of The Joseph Challenge Pilgrimage but for whatever reason cannot participate, you can still offer assistance! We could use you as a volunteer in a few different roles throughout the pilgrimage. Or, you can contribute monetarily to help offset some of the costs. Please use the "Contact Us" form to let us know you would like to help but cannot participate. Of course you can always help us by spreading the word to other men. Will I be able to make a freewill contribution to the Shrine of St. Joseph? Yes, during the Offertory on Sunday during our final Mass, you should consider giving generously to the Shrine for them letting us use their space.